I am not a one for baking and cooking but I thought I may as well have a go at baking cute Christmas Santa cupcakes in the lead up to Christmas. These are gooey chocolate cupcakes with added chocolate, icing and strawberries. I am not that good with baking sponge so I cheated (please don't kill me). To begin use the Betty Crocker mix and put it in a large mixing bowl with the oil, water eggs. Mix it all together using a and you get a thick chocolatey mixture. Once you've evenly filled the cupcake cases, pop them in the oven for 20 minutes. Whilst they are baking, take the ready-roll icing, roll it out flat making sure you have a good thickness. Use a cookie cutter and cut out circles of white icing which will go flat on to the cupcake. You then roll small balls of icing which will be the bobbles on the hats. After they've baked take them out and let them cool off. Once they are cool, you put a small amount of melted chocolate on the top of the cupcake so the icing circles stick to the top. Once the first layer of icing is done you can then put some chocolate underneath the strawberry and place it upside down on top of the cake. As well as putting a small amount of chocolate on the small balls of icing. 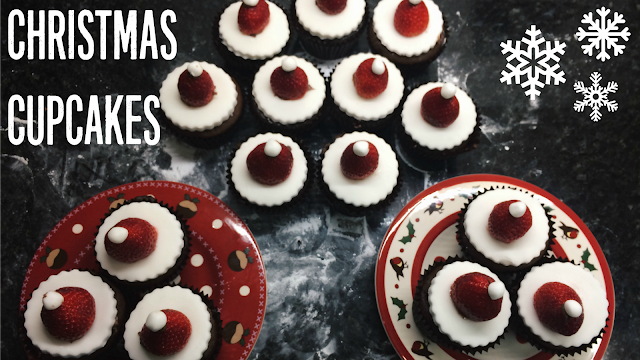 And ta-dah you've officially mastered these super easy, quick Christmas cupcakes. They are mega cute and perfect for a sweet treat over the festive holiday.